Joel Feder February 27, 2019 Comment Now! The 2020 Mercedes-Benz GLC300 broke cover on Wednesday with the German automaker's latest tech, a tougher look, and more power. 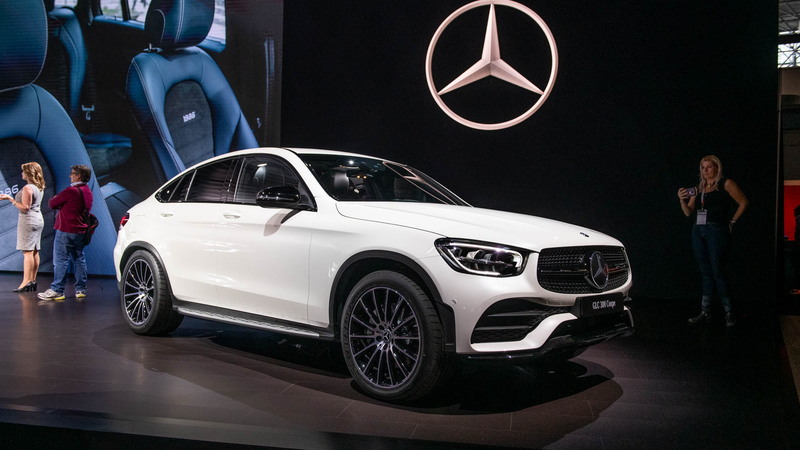 Set to make its formal debut on March 5 at the 2019 Geneva International Motor Show, the refreshed compact GLC luxury crossover SUV gets updates to fall in line with its larger sibling, the GLE-Class. New front and rear bumpers, a two-bar grille, and LED head- and taillights work together to toughen up the luxury crossover's soft look. Wheels ranging from 18- to 20-inches fill the wheel wells, while a massive piece of chrome trim spans the bottom of the rear bumper for some bling. Models with an AMG Line package can be spotted by their chrome diamond-block grille, more aggressive front bumper, and angular exhaust tips out back. The package also adds presence with 19-inch AMG five-spoke wheels and available 20-inchers from AMG. Inside, the 2020 looks pretty much the same as the outgoing model, but looks can deceive. 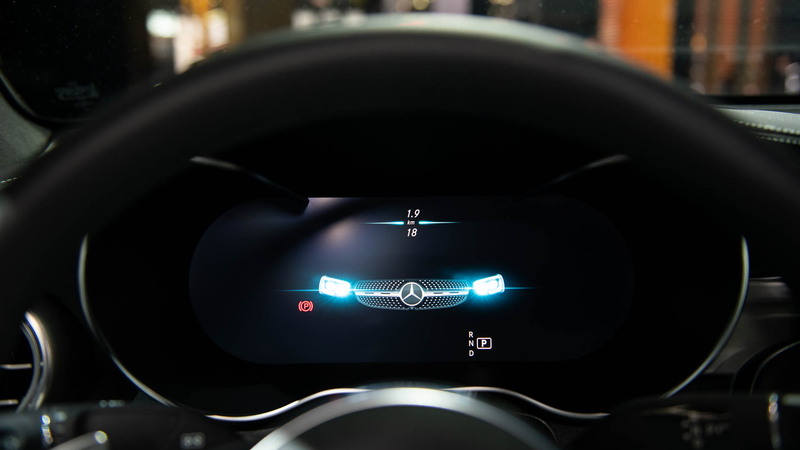 Mercedes-Benz adds its latest infotainment system, dubbed MBUX. A 10.3-inch touchscreen infotainment screen can be controlled via steering wheel-mounted touch controls, a center console-mounted touchpad, gesture controls, voice commands, or the screen itself. It's the same system found in the 2020 GLE and 2020 A-Class, and it wakes up to the command "Hey Mercedes." The system features Apple CarPlay and Android Auto compatibility. Augmenting the tablet-like touchscreen is an optional 12.3-inch digital gauge cluster that features different display layouts: Classic, Sport, and Progressive. Under the hood, the 2.0-liter turbo-4 now makes 14 additional horsepower for a total of 255 to go with 273 pound-feet of torque. Power is still sent to the rear or all four wheels via a 9-speed automatic transmission. Mercedes said the updated engine is also more efficient than the outgoing version, but we'll have to wait for EPA ratings to find out exactly how much. Optional or standard, all of Mercedes-Benz's latest safety tech is on the table. Every 2020 GLC comes with blind-spot monitors, forward-collision warnings with automatic emergency braking, and an attention monitor. Adaptive cruise control with the ability to adjust the GLC's speed based on posted speed limits, an automatic lane-change feature, and active lane control are available to make road trips less stressful. Like any Mercedes, the options list runs deep with everything from an air suspension and a Burmester surround-sound system to three-zone automatic climate control and a head-up display. Mercedes-Benz hasn't said how much the 2020 GLC will cost when it arrives at dealers later in 2019, but it's not likely to to change much from the current base price around $42,000. For more Geneva show coverage, head to our dedicated hub.